So, I'm going to do a random blog post once a week. I need to do something to make this place a little more exciting. I'm getting bored with myself. I'm not sure that the weekly random posts will do it, but it's worth a shot. E trying to make it look like he has a missing tooth by using a blueberry. All his friends and cousins have lost teeth; he is feeling a bit left out. This is Little Miss' favorite spot in the backyard. She has mastered the "seesaw" swing (that's what she calls it). 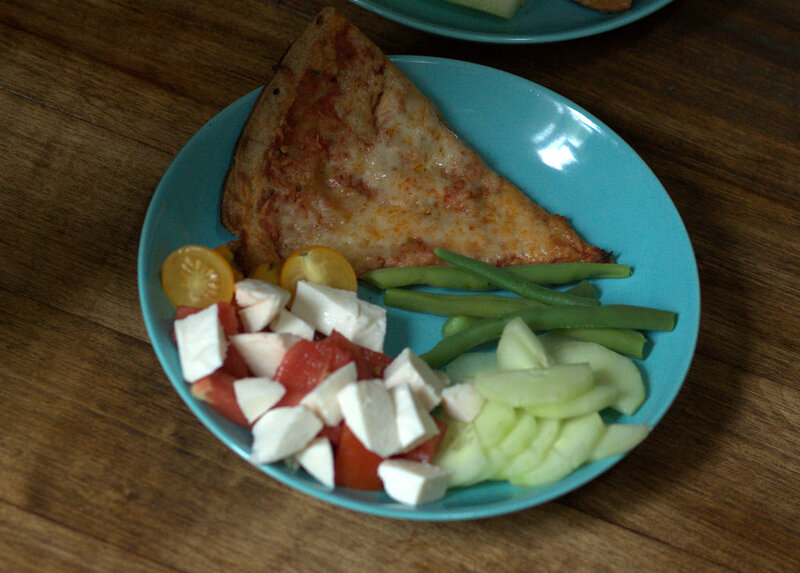 A summer lunch, grilled pizza, homegrown tomatoes and fresh mozzarella, cucumbers and green beans...YUM! A rainbow viewed from the BJ's parking lot while waiting for Daddy to grab a few things inside the store. A (barely alive) crab on the shore at Bullock's Point. Apparently there used to be a lighthouse nearby. Now there is a beautiful view, but horribly dirty, gross water! We found many crabs (not alive at all) and some other treasures as well. Walking along places like this make me so disgusted! Why is it necessary for people to destroy things that potentially could be beautiful? No, Little Miss does not have wet pants because she sat in the water, she went to the bathroom in her pants. There is something about the sound of water that just make the girl lose it (literally). Another (dead) treasure. Visiting this shoreline made me think of the horrible catastrophe with the Gulf Oil Spill. I can't imagine the devastation that exists there. It was a good lesson for the kids because they were curious as to why the water was so murky and why the sealife was dead along the shore. It became a teachable moment...hopefully it sticks! As I write this, I also think of the people in the world who do not have clean drinking water. I did not want my children to even put their hands in the water, never mind drink from it. Some people have no choice. Take a few minutes and visit Charity Water.